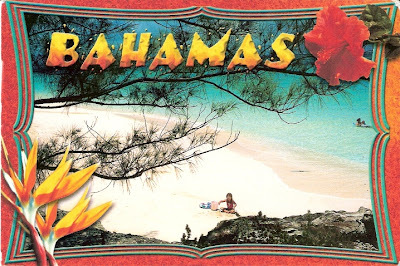 This postcard was sent to me from my friend Tiffany who recently got back from a trip to The Bahamas! According to her this postcard doesn't do the place justice which I can definitely understand since most postcards that I find don't! That's why I should make my own postcards but I do love love love getting them from people. Thank you Tiffany for being an awesome friend, you're the best! I never really thought this whole "add to my collection" thing would catch on but I am finding that I have some really amazing friends who are extremely thoughtful in those ways. Staying connected with you all is what I cherish the most especially since I don't have very many friends here in Boone. Which by the way is entirely my fault because I don't really make any effort to find any. But honestly I'm okay with that. I have really enjoyed reacquainting myself with friends that I believed to be long lost until Myspace came along. It's amazing how easy it is to keep contact with folks that way. And finding people you haven't seen or heard from in years is always the best surprise. Last night I spoke with an old friend named Kelly whom I went to school with parts of middle school (we just realized) and high school which is where we were really good friends. It was great reminiscing with her after almost 10 years, the constant "do you remember" him/her. Thinking about our dorky JROTC days and boot camp and all of the other people we came to know so well will forever stay ingrained in my memory. Thinking back I've had some really great friends along the way - it was hard growing up and moving back and forth all the time. My Mom kept us on the go when we were younger. I don't even know how many elementary schools I went to, middle schools I would say about 3 maybe 4, and High School I know I went to 3 total. So, that's just a lot of moving around - making friends all over again in each new place we went. It was hard leaving people behind especially when you are younger and can't quite understand why you have to go. But like I said I met some really influential people that I will not soon forget & I can only hope that those I have yet to make contact with again that we will somehow find one another down the road.